This Christmas, a new, six-part adaptation of Neil Gaiman’s mythical fantasy about the trickster God Anansi and his unsuspecting son Fat Charlie is coming to Radio 4. We're very happy to be broadcasting this story of love, laughter, music and murder; of old gods and new tricks. Anansi Boys is available to listen to live and on-demand via the Radio 4 website anywhere in the world. The six-part story begins on Christmas Day at 23:30 GMT with a 30-minute episode. Then we return to Neil Gaiman’s world every night of Christmas week, at the same time. The series finale is a 60-minute episode, broadcast at 14.30 on Saturday 30 December. You can live stream the audio online all around the world. Soon after broadcast the audio becomes available online. This can take up to an hour. Anansi Boys is then available to listen to for 30 days after transmission. If you’re in the UK and Ireland, you can also listen and download Anansi Boys via the BBC iPlayer Radio app. Here you can download any programme for 30 days from broadcast and listen anytime, anywhere. As an extra treat, our sister station Radio 4 Extra will be rebroadcasting Terry Pratchett and Neil Gaiman’s Good Omens from Christmas Day. If you are having problems listening to any of the programmes, further help and advice can be found here. 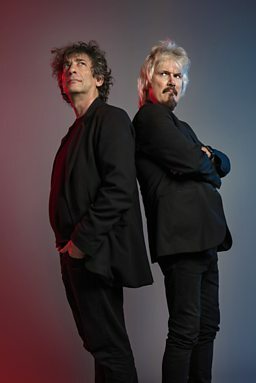 Dirk Maggs has adapted no fewer than five of Neil's books for Radio, including Neverwhere and Good Omens. This adaptation of Anansi Boys is Neil Gaiman’s favourite so far. What came first - Anansi Boys or American Gods? Jacob Anderson on the similarities between him and his character . What are the Anansi Stories? Adjoa Andoh - aka Birdwoman - explains the folklore behind the story. An exclusive cameo appearance recorded in 2014.